可算名詞 【植物, 植物学】 サルサ(パリラ) 《中米原産のユリ科植物》. From Spanish zarzaparrilla. The first element may ultimately derive from Basque; see zarza for more. 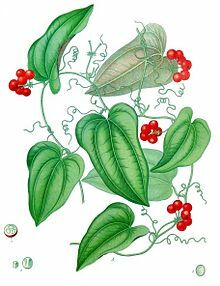 Any of various tropical (Central かつ South) American vines of the genus Smilax, such as Smilax regelii, which have fragrant roots. The dried roots of these plants, or a flavoring material extracted from these roots. A beverage (soft drink) flavored with this root, such as root beer. Any of several North American plants, of the genus Aralia, having umbels and small white flowers.